For more than 70 years, Mosley’s enemies have maintained the myth that the East End of London rose up against the Blackshirts at the Battle of Cable Street and British Union went into decline. Nothing could be further from the truth. 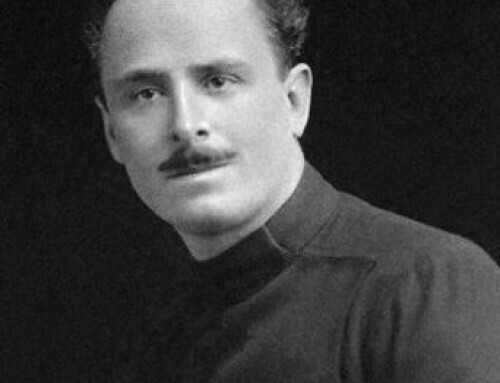 Arthur Mason, later British Union District Leader for Limehouse, recalled that in the two days after the banned March, 600 new members joined the East London Limehouse branch alone. Five months later came the local elections which in those days only the heads of households could vote in (see https://en.m.wikipedia.org/wiki/Suffrage#Forms_of_exclusion_from_suffrage) This effectively prevented Mosley’s young East End supporters from voting in what was called a ‘Dad’s and granddad’s election’. Despite this handicap, in March 1937 British Union won over 23% of the vote in Limehouse. Without that handicap it could have been over 50%. This proved conclusively that East London was a stronghold of British Union and Mosley’s Blackshirts had not been put to flight by Communists and their left-wing allies. The ‘Observer’ newspaper commented (7/3/1937): ‘the size of their vote was a surprise even to those in touch with the East end’. The ‘Guardian’ (5/3/1937) called it ‘a surprising indication of strength’. Even the communist ‘Daily Worker’ (5/3/1937) admitted: ‘a disturbing feature is the large number of votes they recorded’. In the November 1937 Borough Elections British Union candidates moved up into second place in Limehouse putting a Tory/Liberal coalition bottom of the poll. The ‘Daily Worker’ noted (3/11/1937) : ‘For the whole of Stepney the fascist vote was 19%, an overall increase’. In the remaining years of peace, East London remained the Blackshirt heartland. At his very last appearance in the district on May Day 1940 Mosley addressed a friendly crowd well in excess of 100,000 at Victoria Park Square. Almost total censorship of Mosley and British Union activity in East London by the press and the BBC left the rest of Britain generally unaware of the growing strength of Mosley’s Balckshirts in this important working class area of Britain’s capital city. 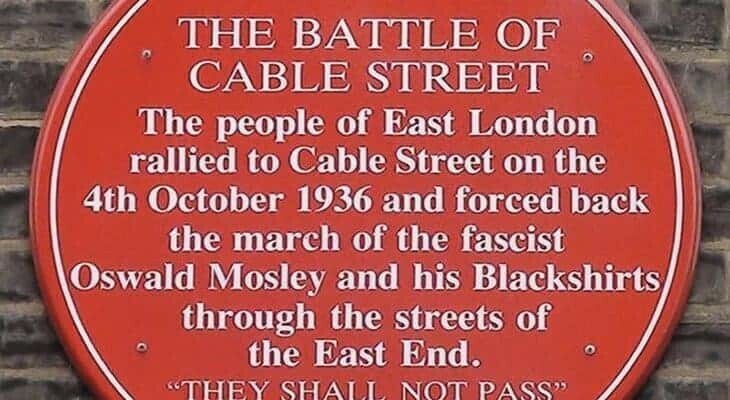 This assisted the left-wing created myth that East Enders stopped Mosley once and for all at the Battle of Cable Street and his support thereafter declined. This fraudulent historical view has continued to appear in history books and autobiographies for over 75 years. 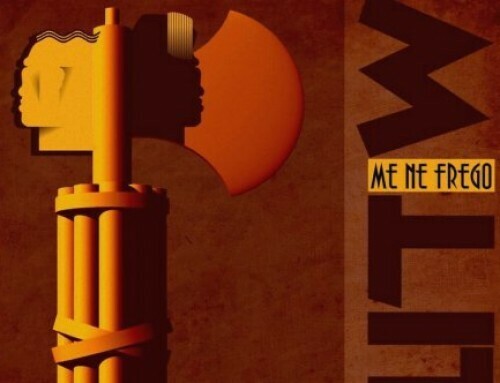 Only recently is the truth beginning to emerge thanks to a new generation of enquiring academics and historians unwilling to accept political myths for which there is no substantiation. After the Commissioner of the Metropolitan Police, Sir Philip Game, banned Mosley’s East London march on Sunday 4th October 1936, the main body of Blackshirts marched west to their National Head Quarters in Westminster. 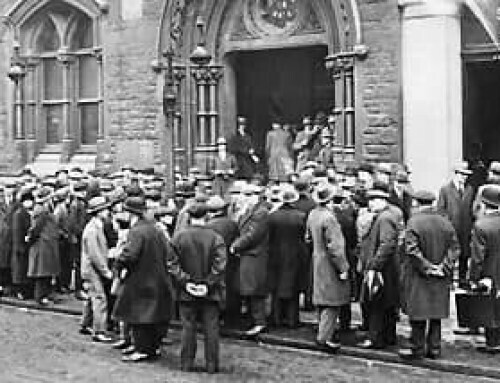 But back in East London at the four places where Mosley was going to speak Blackshirt meetings DID go ahead and Blackshirts DID march through East London late in the afternoon of the ‘Battle of Cable Street’. This fact was ‘overlooked’ in the leftist myth that East London workers rose up and drove Mosley’s Blackshirts out of the area. But the march and meetings that did take place were clearly recorded at the time in Special Branch Police reports now released at the National Archives, Kew. ‘Aske Street, Shoreditch: The platform was set up at 10am and Lionel Duncan held the pitch for British Union. At 5.30pm 1000 people were still waiting to hear Mosley. Bailey, Nagels and Bill Hunt spoke. 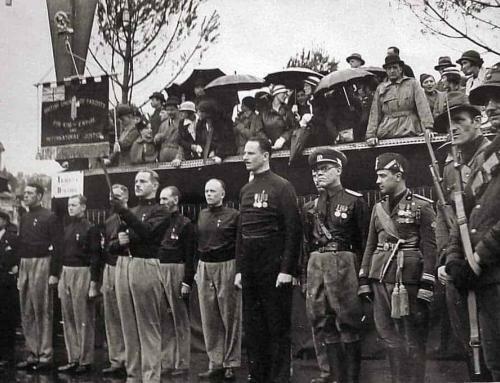 All the Blackshirt speakers were enthusiastically received by the audience and there were many cries of ‘Shame!’ when it was learned that the march had been banned. Meeting ended at 7.35pm. No disorder. Chester Street, Bethnal Green: Police moved the British Union meeting to this site from its proposed location at Victoria Park Square. Alf Cooper held the platform from from 12.15pm. At 5.15pm there were 400 people present and 6 in Blackshirt uniform. This increased to 1500 with 26 in Blackshirt uniform. Mick Clarke, British Union District Inspector of the 8th London Area, spoke for 30 minutes denouncing the Government ban. At 6.05pm he closed the meeting and led a march of Blackshirts and supporters for one mile through Bethnal Green back to their District Headquarters at 222 Green Street. No disorder. Stafford Road, Bow: Alex Brandon and Eddie Turner held the platform for British Union. 300 people were still present when Turner closed the meeting at 5.50pm. No disorder. Salmon Lane, Limehouse: Platforms in position at midnight. By 11a.m. there were 300 people waiting to hear Mosley speak. Charlie Lewis and Dave Robinson addressed the crowd which by 3.45pm had increased to 5000. At 5p.m. 200 Reds attacked the speaker and the police closed the meeting. The Sunday after Cable Street the Communist Party tried to hold another ‘Victory’ march in East London. The Morning Post reported (13/10/1936): ‘The Victory March organised by the Socialists and Communists had a stormy progress through the East End’. The Blackshirt March across East London. The Wednesday after the failure of the Red ‘Victory’ March was a day of mounting excitement in East London as rumours grew that Mosley was coming. Sure enough, the Leader of British Union appeared at an unadvertised meeting and spoke to several thousand cheering people in Victoria Park Square, Bethnal Green. He then headed a march to Salmon Lane, Limehouse, which grew in numbers with every street it passed. ‘Mosley spoke at Victoria Park Square where the crowd had grown to 7,000 by 8pm. It was noticeable by the salute that 80% were his supporters. They marched to Salmon Lane, Limehouse, where the crowd swelled to 12,000…500 in British Union uniform. It was remarkable, in view of the attitude adopted by the anti-fascists towards the previous fascist march, that this procession should pass unmolested and practically unopposed…at intervals the fascist salute was given by people in doorways or on the pavements.’. Phil Piratin, Communist Organiser, wrote of the meeting in “Our Flag Stays Red”: ‘I went along to this meeting and watched to see the support which Mosley had…what kind of people would march. The fascist band moved off and behind about 50 thugs in Blackshirt uniform. Then came the people…men, women (some with babies in arms) and youngsters marched behind Mosley’s banner. I knew some of these people, some of them wore trade union badges…Why are these ordinary working class folk supporting Mosley? 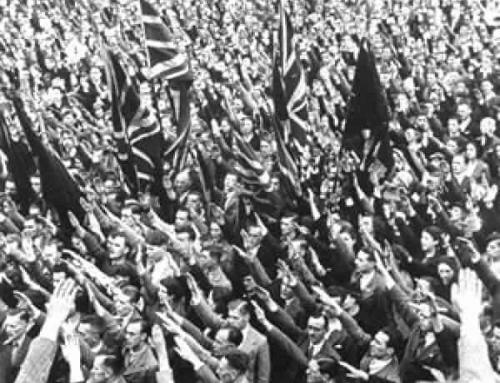 Obviously because Mosley’s appeal struck a chord…above all these people were living miserable squalid lives’. Joe Jacobs wrote in his memoirs: ‘The fascists did rally in Victoria Park Square…and did march through Mile End to Limehouse right across Stepney.’ Jacobs claimed that Stepney Communist Party had a membership of around 300 at the time. However, Special Branch report HO144/21064 states that the Blackshirt membership for Limehouse, which was just one part of Stepney, stood at 1,700. (One of their agents had broken into the British Union Limehouse District Headquarters in Essian Street at night and read the membership ledger).